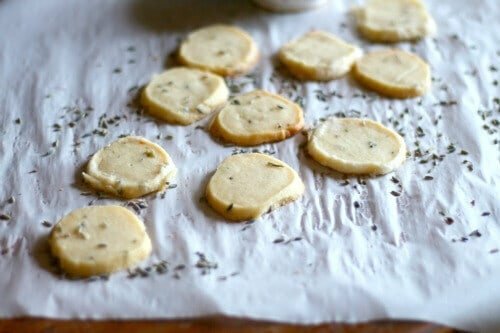 Everyone needs an easy biscotti recipe and this one couldn’t be easier or more unique. 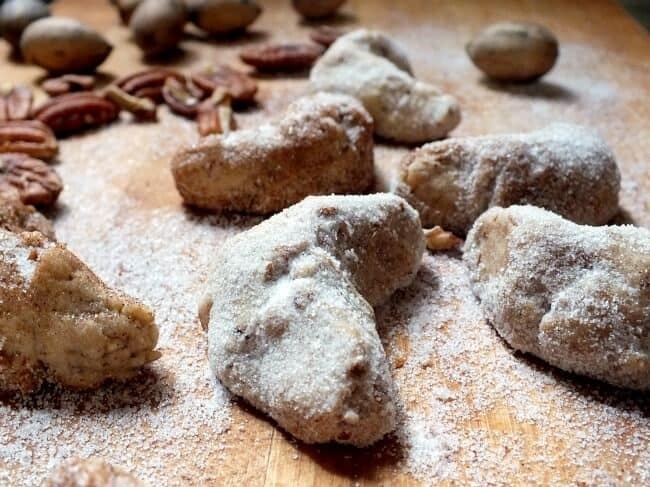 This classic Italian recipe gets all southerned up with the the addition of cornmeal, bourbon, and pecans. The result is a sweet, crunchy, nutty bite of southern goodness. Perfect for gift giving or shipping to loved ones overseas. I love biscotti. Sometimes I’ll head over to a coffee shop with my laptop and sip a latte while I indulge in a biscotti. Being a bit of an Anne Shirley I tend to imagine myself in Italy enjoying the view. Trust me, that takes a LOT of imagining because the nearest coffee shop is on the I-35 service road. I like it so much better when I make my own lattes and indulge in homemade biscotti! At least I have a choice of sitting on the back deck and watching the birds or sitting on the front porch and watching the squirrels. 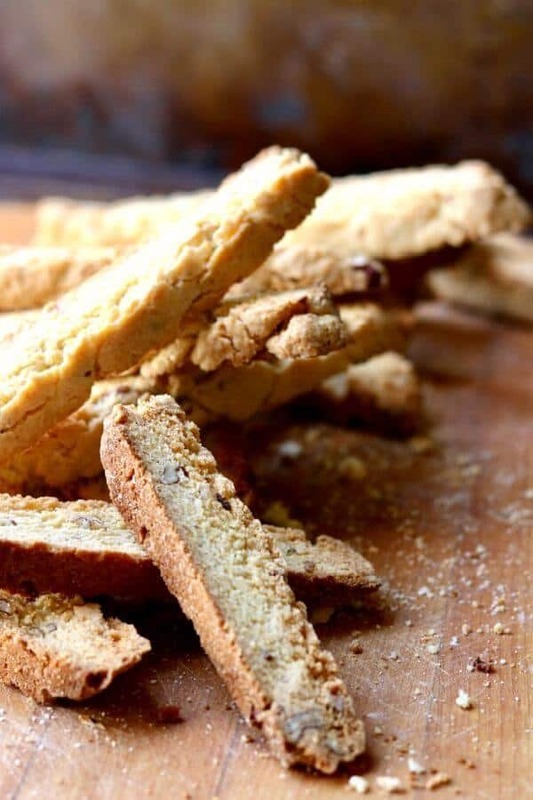 This easy biscotti recipe will have you making biscotti often. We went through this entire batch in about 36 hours… and I wasn’t eating them because I am seriously low-carbing right now. No worries – I’m working on a low carb biscotti. Just haven’t gotten in right yet. I’ll let you know on Facebook when it is. The hardest thing about making a homemade biscotti recipe is waiting for it to be cool enough to eat. It gets baked twice which is what gives the cookies its unique crispness and texture. First you form it into a wide, thinnish loaf and bake it for about 30 minutes. You take it out of the oven and let it cool for 20 minutes then slice the loaf into cookies and bake them again, turning them about halfway through. 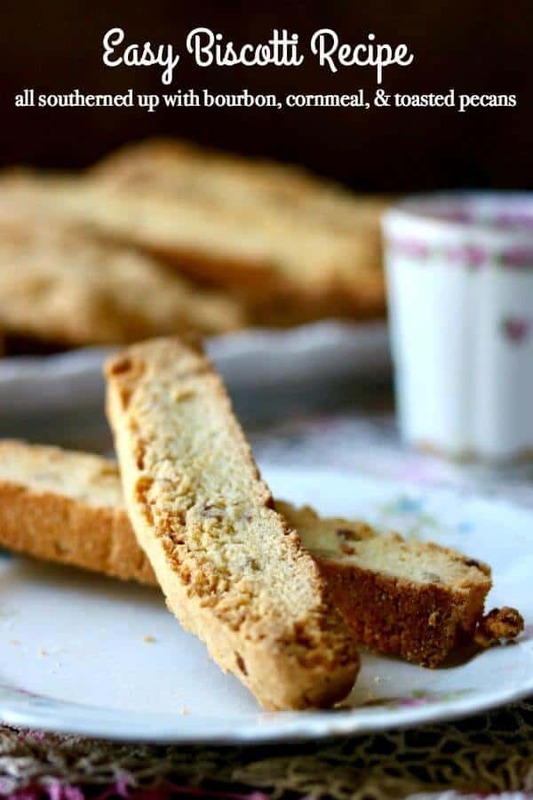 It IS a SUPER easy biscotti recipe but the cutting requires some thought. Personally, I like to cut on a diagonal which gives me some super long cookies albeit fewer. Cutting the loaf straight across makes more cookies but the are smaller. Still, the smaller ones are the same size while the longer ones have numerous sizes. It’s up to y’all. There is no right or wrong way to go with an easy biscotti recipe like this. Unless you don’t make it. That would be SO wrong. I know some of y’all don’t use booze so if you want to leave the bourbon out go right ahead. Just substitute water and vanilla according to the instructions. You’ll do fine. 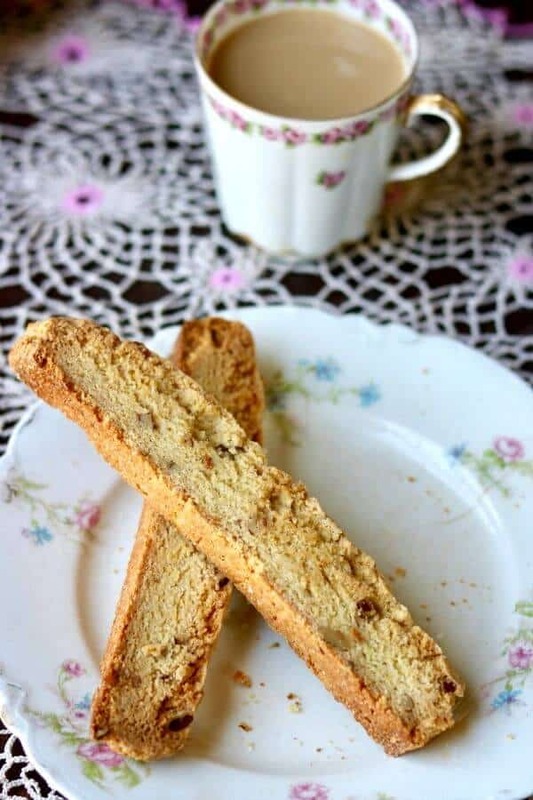 You’ll love the unique, nutty flavor of this Southerned up biscotti! Once you’ve made it give my other favorites, spicy gingerbread biscotti and pumpkin biscotti a try! This unique biscotti recipe couldn't be easier! 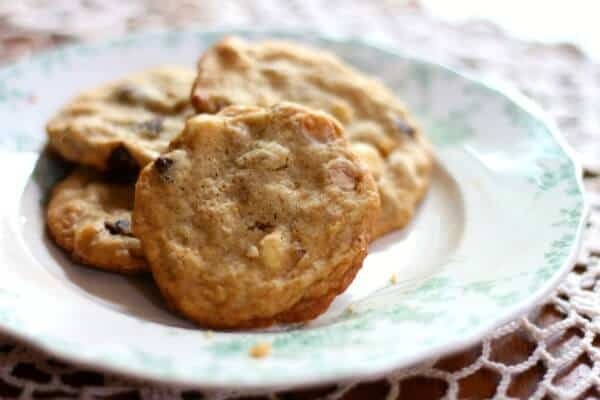 Sweet and nutty recipe that's perfect for dipping in coffee, tea, or hot chocolate. Toast pecans in a 350F oven for about 5 minutes. Mix the flour, sugar, cornmeal, baking powder, salt, and pecans in the bowl of a mixer fitted with a paddle. Blend on low for a few seconds or until well blended. On the slowest speed add the butter a little at a time until the mixture looks like small crumbs. Add the eggs and bourbon and beat until you can form a ball with the dough that won't fall apart. Remove from the bowl and form into a long loaf on the silpat covered baking sheet. The loaf should be just a little higher than your fingers if you lay your flat hand next to it. Remove from the oven and let cool on the baking sheet for 20 minutes. Don't let it get cool - it needs to still be warm. Put the loaf on a cutting board and slice it into 1/2-inch thick slices. Some people use a serrated knife - I use a chef's knife. Use what works best for you. If you slice straight across you'll get about 24 medium sized biscotti. If you cut on a diagonal you'll get about 18. I prefer to cut on the diagonal. Place cut side down on the baking sheet and put back in the oven for 10 to 12 minutes. They should be lightly browned around the edges. Carefully turn each biscotti over and return to the oven to bake for 10 minutes more. Leave on the baking sheet until completely cool. Store in an airtight container. Store tightly covered in the pantry. Biscotti will keep for weeks.